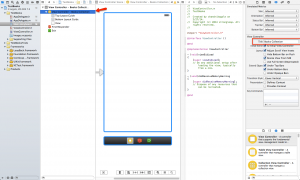 In this two-part tutorial we’ll be creating an iOS app that connects to a LoopBack API server to perform create, read, update, and delete (CRUD) operations. In Part One we’ll show you how to fetch data stored in an in-memory data source. 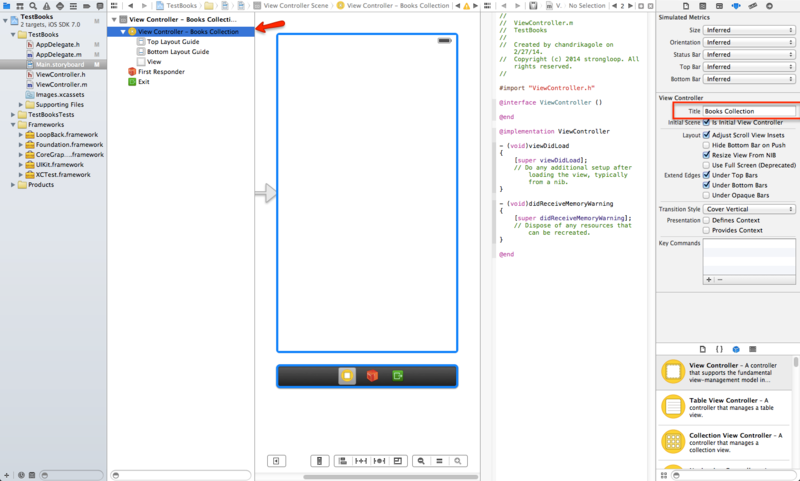 Part Two will explain how to connect various interface elements to the iOS app. Install Apple XCode version 5 or later. Follow the Getting Started instructions to install the StrongLoop command-line tool, slc. Step 2: Follow the instructions in Create a LoopBack application to create a model called “book” with the default properties. 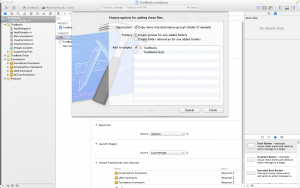 Follow the instructions in the link to the section “Defining a model manually”. Step 3: Run the app and load this URL in your browser to view the API explorer: http://localhost:3000/explorer. 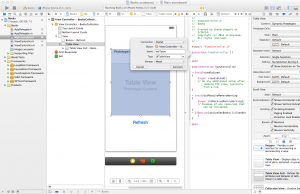 Step 1: In Xcode, choose File > New > Project > IOS Application > Single View Application. Step 2: Name the project “Books” (or choose another name if you prefer). The instructions below assume the project is named “Books;” if you use a different name, then some files will be named different accordingly. Step 3: Select iPhone as Device. Select location and create project. 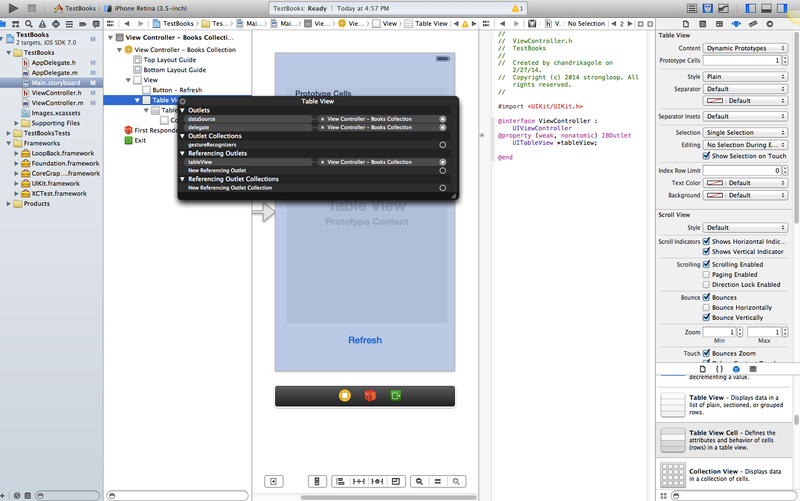 At this point, you should have a project created in Xcode with a bunch of default files. 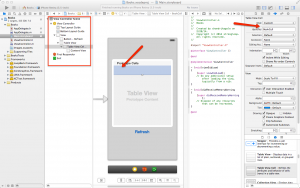 From the LoopBack iOS SDK, drag Loopback.Framework to the Frameworks directory in your application. 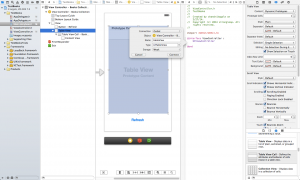 Select and drag a Table View to the View Controller. 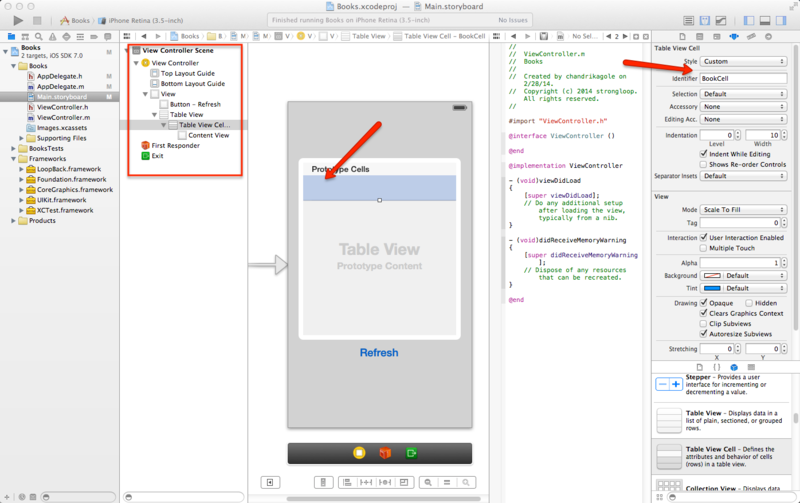 Add a Table View Cell to the Table View. Click on the Table View Cell and enter “BookCell” as the Identifier. You will use this later. The View Controller should look like the screenshot below. Make sure the file hierarchy in the second panel is same as the screenshot. 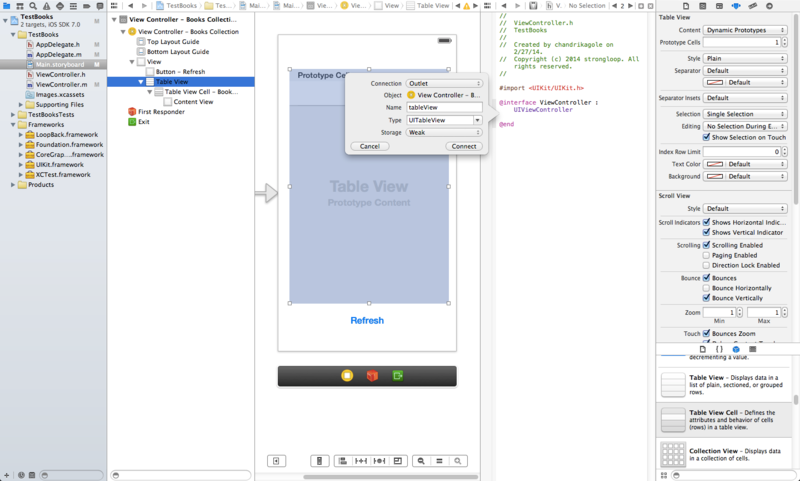 Define the TableView property by control-dragging into the ViewController.h file, as illustrated below. 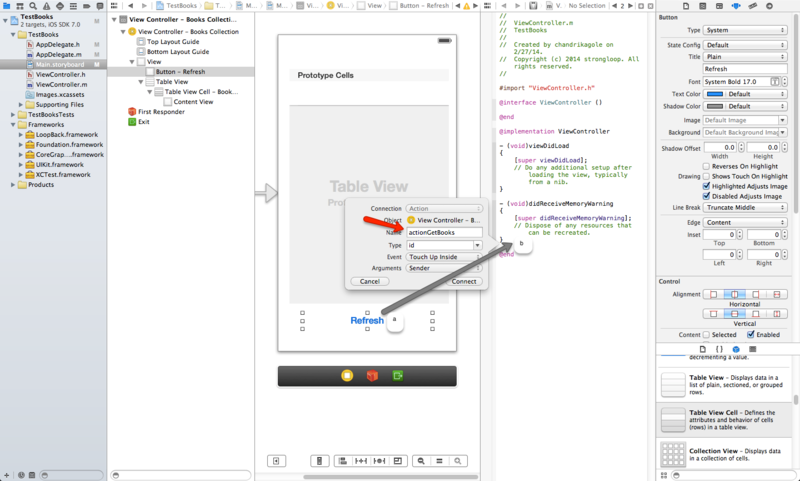 Define *myTable by control-dragging into ViewController.m, as illustrated below. 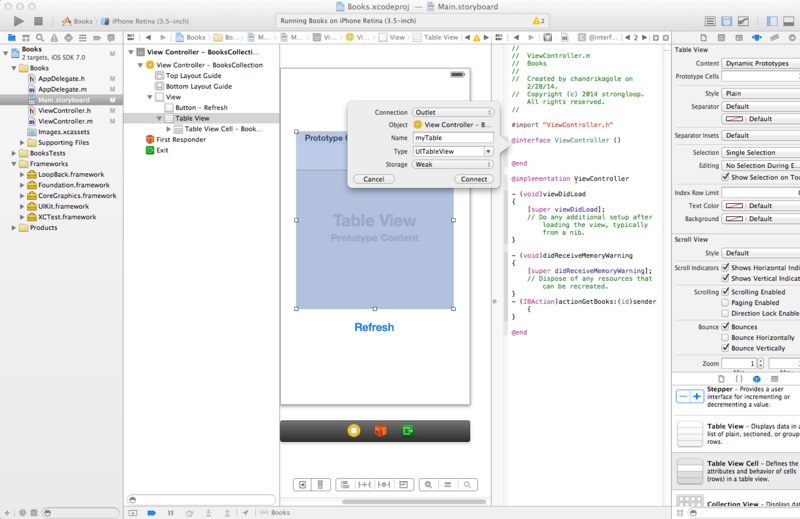 Set outlets for the TableView by control-dragging them to the View Controller. In the second pane, right-click on Table View. Under Outlets, click on dataSource and drag it to the Books View Controller. Click on delegate and also drag it to the Books View Controller. 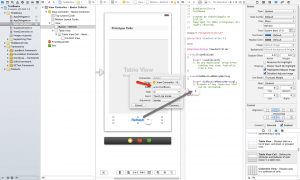 Define the interfaces for the table. Define the getBooks function. Refer to the comments in the code below. //Logic - Get all books. If connection fails, load the error block, if it passes, call the success block and pass allbooks to it. // To display data in the table. Call getBooks from the actionGetBooks function defined in Step 4. At this point you should be able to build your app and get the list of books. Build the app and run it on a simulator. Click Refresh and you should be able to see the list of books.